Last night was rough. Myra got sick on Sunday and was up four times last night with a fever. I stayed home with her today and we both muddled through the day. Being home all day is hard when it comes to food! I just wanted to munch, munch, munch. I had my normal breakfast (Kashi Go Lean) but a couple hours later, after an apple and string cheese, I had a bowl of Miguel's cereal (Frosted Flakes). I also snacked on all of Myra's snacks (crackers, cookies, etc), although I kept it to one or two. We had to run out for more children's Tylenol and I resisted all the junk I wanted to buy in the drugstore. But I didn't resist fast food and picked up a 2 piece meal at KFC for lunch. While I was ordering I noticed the calorie range on that meal went all the way up to over 1400. Wow! I can't imagine which choices for the two piece meal could be that many calories. I got it home and they got the order wrong, instead of extra crispy they gave me original recipe. So I ate the thigh and decided that since it wasn't my favorite I'd leave the rest of the meal for Miguel. Plus I was still a bit freaked out by that calorie count. I just checked and the thigh had 250 calories (extra crispy would have been 340). But since I've never counted calories those numbers don't have a ton of meaning to me. Not too long after that I had another bowl of cereal. This time it was Nature's Path Optimum Power (whatever that means) Blueberry Cinnamon Flax. I got a sample at the Marin Triathlon and I actually liked it. I bought it to use as my weekend cereal. Let's see...I'm pretty sure I ate some other stuff but I can't remember. Myra was crying more and more so I finally decided to take her to the doctor, despite knowing they were probably going to say it's a virus. And it was, a type that includes mouth sores. So I stopped at a drugstore on the way home to pick up ice cream for her and was still feeling munchy myself so I bought a bag of cheese puffs. Yes, cheese puffs. I think I was just tired and cranky myself after being home all day with a sick baby. I ate most of the puffs on the way home but when I got home I read the bag and noticed the whole thing was four servings! What happened to the good old days of double serving bags? (let alone single serving). One serving had 160 calories, that x4 seemed like a lot. So I dumped what was left, hopefully about one serving, in the garbage disposal. It's never too late to make a new decision. But...moving on. I ended up eating a 1/2 of an avocado and a bowl of Myra's ice cream (rainbow sherbet) for dinner. Oh dear. Things just went from bad to bad to bad when it came to my eating today. I was hoping to get to the gym, though by the time Miguel gave me the green light to go I wasn't feeling a lot of pep in my step. But I changed clothes and went anyway. And good thing because I had a great workout! This is Week 4 - a rest/recovery week. I started with 25 minutes on the upright bike followed by legs/shoulders/core. I did a lower level on the bike and fewer sets of my normal stuff. But when I was done I still felt an energy buzz and decided to run. I hopped on the treadmill with a plan to run for 5 minutes at 7.2mph. But as the minutes ticked off I decided, "why not make it a mile?" I wasn't sure if I could do it but I did. One mile in 8 minutes, 27 seconds. Whew! 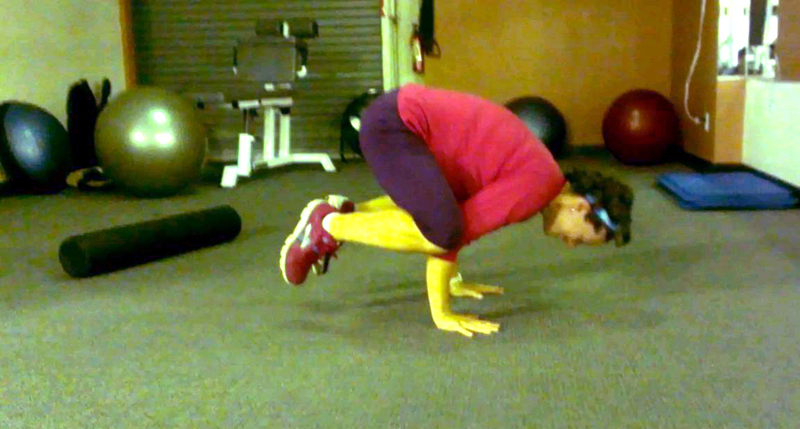 I went to stretch and somehow started messing around with the crane pose. I've never been able to hold it before but today, voila! I've only taken a handful of Yoga classes over the years but this pose has always seemed so cool to me. I'm sure my form is terrible, I think my knees are supposed to be in my armpits, but I was sure able to hold myself up there! This stuff never gets old. Myra will probably need to stay home again tomorrow so I'll have another chance to make better choices. We'll see. Today's choices weren't stellar but they weren't absolutely horrible either, just not very good nutrition-wise. I was hungry when I came home from the gym (what, 1/2 an avocado and sherbet isn't satisfying?!) and in an effort to balance out all the crap I munched on green beans. Like I said, it's never too late to make a new choice. p.s. how do you like my new header? I love it!! Thanks to all my facebook peeps for approving!! Love the new header - gosh you look so strong and healthy! let your bad-eating day go, it sounded like tastebud fun and you'll straighten things out tomorrow. BTW avocadoes are on the "good food" list for me, really good monounsaturated fat and antioxidants...I like that yoga pose too - but can't my knees any further past my elbows than you! You (and the new header) look terrific! Hope your daughter feels better soon. I really LOVE the new header! It's beautiful. Maintaining certainly is a balancing act, no pun intended (especially with the bakasana pose... LOL) I'm sure that, by now, it's a way of life. I hope Myra is feeling better.